The VascuNet™ Pericyte Co-Culture Assay combines HUVECs and pericytes in a co-culture system designed for a 96-well plate assay format. Components include cells, negative control, growth and assay medium with supplements. 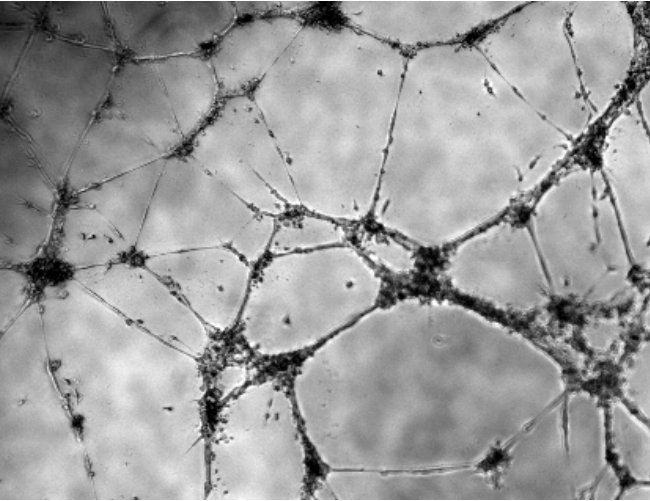 The VascuNet™ Pericyte Co-Culture Assay is a novel angiogenesis model that includes HUVECs and pericytes (PC-Ms) to study the effects of drug and therapeutic compounds on vascularization in a 96-well plate. PC-M cells are derived from a proprietary differentiation method using the ESI-017 Human Embryonic Stem Cell Line. Cells and media components undergo strict quality screening to ensure reproducibility. Networks are maintained for up to four to six days, allowing for a more extensive and clinically-relevant model system for studying the effects of compounds on tube formation. Developed by ReCyte Therapeutics Inc, a subsidiary of BioTime, Inc.
Tube networks are maintained for at least 4 days. All kit components are stable for a minimum of 3 months from date of receipt when stored as directed. Gerhardt, H. and Betsholtz, C. (2003) Endothelial-pericyte interactions in angiogenesis. Cell Tissue Res 314: 15–23. Hamilton, N.B., et al. (2010) Pericyte-mediated regulation of capillary diameter: a component of neurovascular coupling in health and disease. Front Neuroenergetics 2: 5. Stratman, A.N., et al. (2009) Pericyte recruitment during vasculogenic tube assembly stimulates endothelial basement membrane matrix formation. Blood 114: 5091–5101. von Tell, D., et al. (2006) Pericytes and vascular stability. Exp Cell Res 312: 623–629.